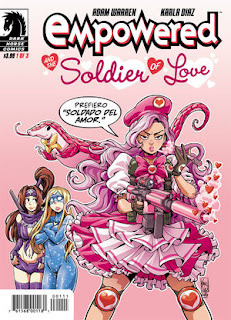 The Fellowship was fortunate enough to obtain a copy of EMPOWERED AND THE SOLDIER OF LOVE #1 from Dark Horse Comics. Adam Warren writes, Karla Diaz draws and colors, and Nate Piekos of Blambot letters. The Superhomeys are Cape City’s staunch defenders, a group of competitive (if somewhat unkind, in Emp’s eyes) supers who protect the city from all manner of badness. But for some reason, this week they’re all acting strange – as in “getting it on with anyone in range” strange. (Emp doesn’t seem to be affected.) But what could be the source of these rampant love vibes? If you’re not familiar, Emp (short for Empowered; she hates the name) is a curvy young woman in a supersuit made from seemingly not very strong material. Lots of rips and tears in strategically lucky places. She may come across as ditzy, but she’s really pretty bright and a very capable super. Warren usually writes and draws (and does both very well), but for this book he has placed art duties in the very capable hands of Diaz, who does a lovely job on both lines and color here. There is a bit of backstory with Empowered, but each arc also stands alone very nicely. This one is no exception, so if you’re new to the series, this is a great jumping on point. EMPOWERED AND THE SOLDIER OF LOVE #1 is available now at your local comic shop or at darkhorse.com.